Congo has long been the focus of resource exploitation. The first era of colonization in Africa, beginning in the mid-1880s, was most pronounced in this central African country. Belgium’s King Leopold brutalized the population in his quest for rubber and riches, leaving a legacy of natural resource exploitation by white Europeans in the heart of Africa. Today, at the 50th anniversary of Congo’s independence, the country continues to be a source of wealth for the world, yet the Congolese people live in poverty. Like many African nations, the Democratic Republic of Congo (DRC) is suffering under this new era of neocolonialism, where natural resources belong not to those who live on the land but to those with power and access to global markets. The pursuit of true independence and liberation in Congo will continue until foreign nations cease their policies of exploitation. When Patrice Lumumba began agitating for independence in early 1960, there was great hope that Congolese people would benefit from the resources of their land, lifting the country out of poverty and into an era of prosperity. Instead, after nearly three months in office as Congo’s first elected prime minister, Lumumba was deposed in a coup and four months later killed in a plot orchestrated by the Belgian government with the complicity of the United States. Mobutu Sese Seko, a staunch opponent of communism, took power in a CIA-backed coup and became one of Africa’s most brutal dictators. He drove Congo — which he named Zaire — into ruin. In 1996, Rwanda and Uganda invaded Congo and forced Mobutu to flee, while a new leader, Laurent Kabila, rose to power. Since then, eastern Congo has been mired in conflict, overrun by rebel groups and government militias, each of which seeks control of Congo’s vast wealth. It’s estimated that between 1998 and 2007, 5.4 million people died in DRC as a direct or indirect result of conflict. Meanwhile, the world has come to depend on minerals such as tungsten, tin and coltan, used in electronics and sophisticated weaponry, which come primarily from the Congo. Western love for the Congo has always been for its resources, never its people, which explains the lack of any genuine interest in helping to build Congo’s state capacity. 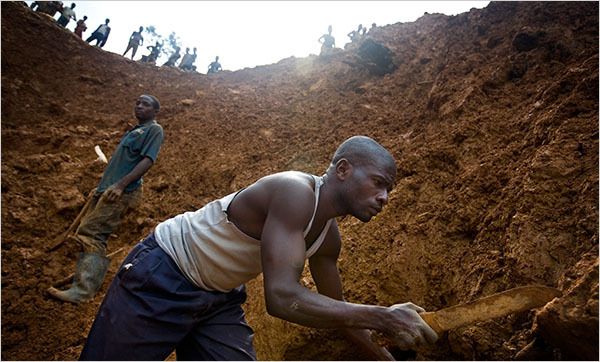 Lack of transparency or regulation in the mining industry in Congo makes it nearly impossible to prevent the sale of conflict minerals in electronic products. And although many companies have expressed interest in disclosing their supply chain information, tracing which minerals come from the conflict zone in eastern Congo remains a significant challenge. Also in May, Brownback was able to attach a related amendment into the Restoring American Financial Stability Act of 2010, which passed the Senate and is being reconciled with the House version of financial reform. While an admirable start considering the inadequate U.S. government attention paid to Congo, such legislation is only a small part of a more holistic policy shift needed to address the economic colonization of DRC. America: Part of the problem? The United States can do much more to promote true security and prosperity in Congo. However, time and time again the United States has been part of the problem. In 2008, the United States was among a group of nations that negotiated the premature and hasty integration of former rebel forces of the Rwanda-backed rebel group, the National Council for the Defense of the People (CNDP), into the Congolese national army. These Rwandan troops, as part of the national army, today represent a serious threat to sustainable peace in eastern Congo. Meanwhile, the U.S.-Rwanda relationship continues to be very problematic as far as peace and stability in Congo is concerned. From 2000 to 2009, the United States provided $1.034 billion to Rwanda when its government was occupying large territories in Congo and plundering Congolese resources. While Washington argues that it never intended to aid the Rwandan invasion in the Congo, U.S. financial support possibly helped the Rwandan government secure money within its budget to wage the deadly war. But it wasn’t the United States, ironically, that took action. Sweden and the Netherlands, after looking at the evidence of Rwandan involvement in the conflict in the Congo made available by a U.N. panel of experts’ report in 2008, threatened to withhold their financial support to Rwanda. This action, which drew international attention to the issue, held the Rwandan government accountable by requesting an immediate withdrawal of its troops from the Congo. Instead of following suit, the United States participated in the misleading and failed integration of former CNDP forces into the Congolese army. So far, the Obama administration shows no sign of implementing the legislation that Sen. Obama worked so hard to promote. The key to the U.S. relationship with Rwanda is rooted in access to Congo’s resources. All governments must enact strict laws against the import of products that fuel conflict, use child labor or otherwise support human rights violations in Africa. Companies should also be forced to pay fines and reparations to communities they have damaged in the creation of their goods. But at the same time, and equally as important, governments must work to engage Africa in the global economy in a way that encourages human security. Although coltan and tungsten fuel deadly conflict in eastern Congo, they also provide local people with jobs and some means of income. The Congolese government, with the support of the international community, should ensure that those local people reap the true benefits of their labor, which requires strict attention to workers’ rights. In this way, Congo and the outside world can partner to advance resource sovereignty and local ownership. Congo and the outside world can partner to advance resource sovereignty and local ownership and ensure that local people reap the true benefits of their labor. The liberation of Congo — which is a key part of the liberation of all of Africa — requires that people in countries that profit from Congo’s wealth stand in solidarity with those who rightfully own it. That means, most importantly, taking action as citizens and pushing governments to create more responsible policies toward central Africa regarding the use of its natural resources. Bahati Ntama Jacques, a Congolese national, is policy analyst at the Africa Faith and Justice Network in Washington, D.C. Beth Tuckey, former associate director at Africa Faith and Justice Network, is currently an executive intern with Africa Action in Washington, D.C. They are both contributors to Foreign Policy In Focus, where this story first appeared, at http://www.fpif.org/articles/congos_quest_for_liberation_continues. "Congo and the outside world can partner to advance resource sovereignty and local ownership and ensure that local people reap the true benefits of their labor." You can't call on a people to stand in alliance with the Congolese when most of the world relies on the resources coming from the Congo to support a lifestyle. If the Congolese controled and dictated the profits coming from THEIR resources then the world couldn't continue there materialistic lifestyle that means no mass prodct of computures, cell phones, air planes and so forth. This World is full of greed and over consumes how can it stand in alliance with those who now how to perserve and use only what is needed? The Netherlands is now a member, claiming to provide balance and ensure fairness, on Rwanda's National Electoral Commission, heading into this sham election. Fairness? P.S.-Imberakuri Party candidate Bernard Ntaganda is in prison; Rwanda Green Party Vice President Andre Kagwa Rwisereka has been beheaded; and Victoire Ingabire Umuhoza has no place to live after the next two days because two landlords have evicted her, after receiving death threats, and a third just got too scared to sign a lease today. The Netherlands is one more expression of the gargantuan Euro hypccrisy behind all this, including that of the European Union which decided it couldn't afford to send election observers to Rwanda but sent 5.3 million Euro instead. That's one Euro, more than a few dollars, to bully every single Rwandan eligible to vote into doing so. See "Dutch government helping Kagame rig election? ", on this website, http://sfbayview.com/2010/dutch-government-helpin….